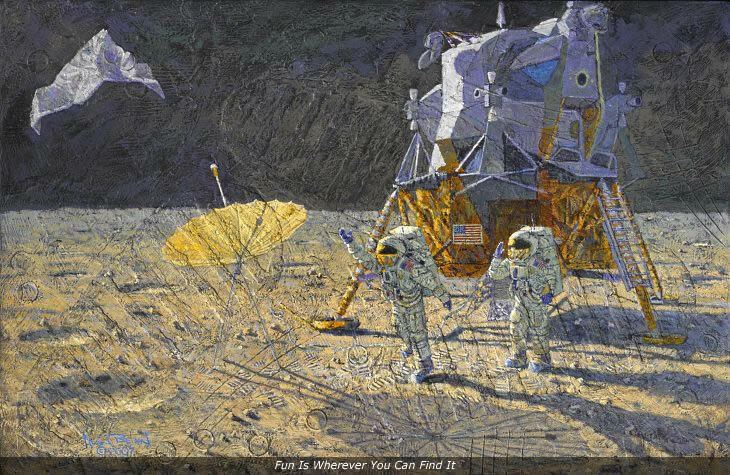 Completed 2007, textured acrylic with moondust on aircraft plywood, 30 1/8" x 19 7/8"
Some of my favorite memories of my two moonwalks on Apollo 12 are of just having fun. Sure, every minute on the surface was carefully planned prior to launch, and yes, we had our minds filled with important scientific and engineering concerns and procedures. But, there were just so many strange and wonderful things about this unfamiliar new world. For example, with the Moon having only one-sixth the pull of gravity of the earth and also having no atmosphere to slow down moving objects I couldn't resist seeing how far I could throw an occasional rock or two. Near the end of our last moonwalk, as I was recovering our solar wind collector, I passed a large piece of discarded aluminum foil insulation. There it was... A temptation too shiny to resist. I said, "Pete, I'm going to see how far I can throw this piece of foil." Pete called back, "Wait a minute. I want to watch." Now, on earth throwing foil isn't all that much fun to watch. The foil will flutter and land only a few feet away. But not on the airless moon, where it will move as quickly as if it had been crushed in a tight ball. As Pete turned to watch I gave the foil my strongest heave. Up, up, up it went, slowly turning over and over. Parts of the foil were flashing in the bright sunlight as it got smaller and smaller . . . Higher and farther away than the best athlete could kick a football on earth. But now to get back to real scheduled work. Pete and I had to pack up and climb back inside the lunar module with our treasure of experiments and moon rocks. We were still a long way from home.